Now you’ve completed the quiz in the previous Step, take a look at the table below which summarises what is happening to the air from the four major air masses as they approach the UK. 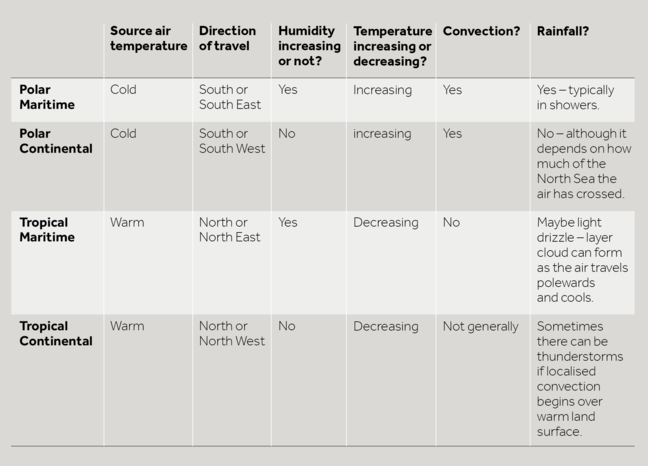 You can view a PDF version of the recognising air masses table above. 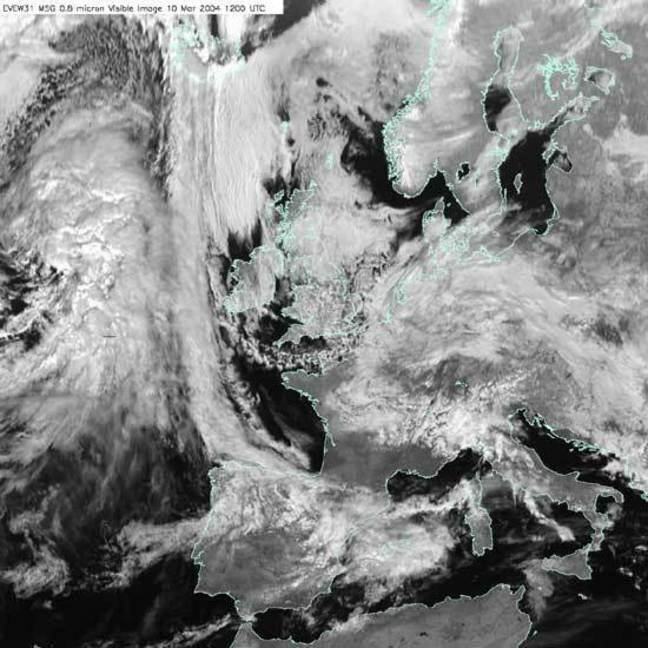 The satellite image in Figure 1, shows Tropical Continental air over much of continental Europe and the UK. 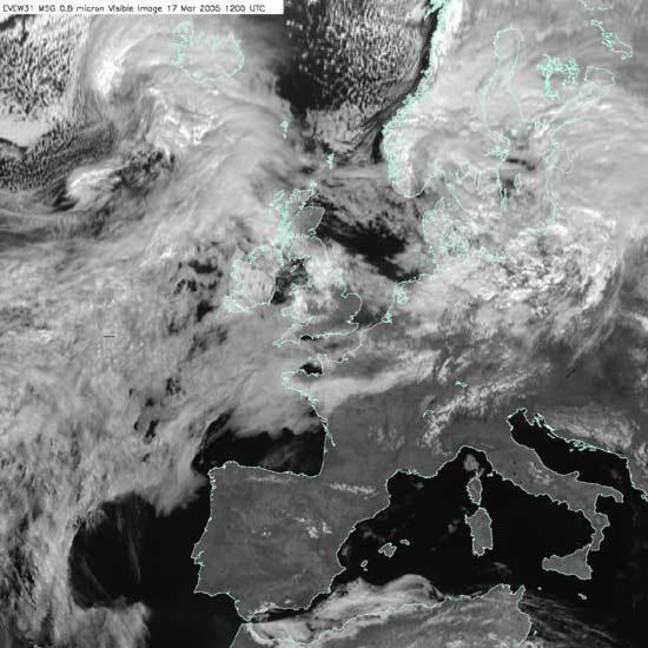 Although there is a front coming in from the west, before it arrives much of the UK is cloud free and sunny. 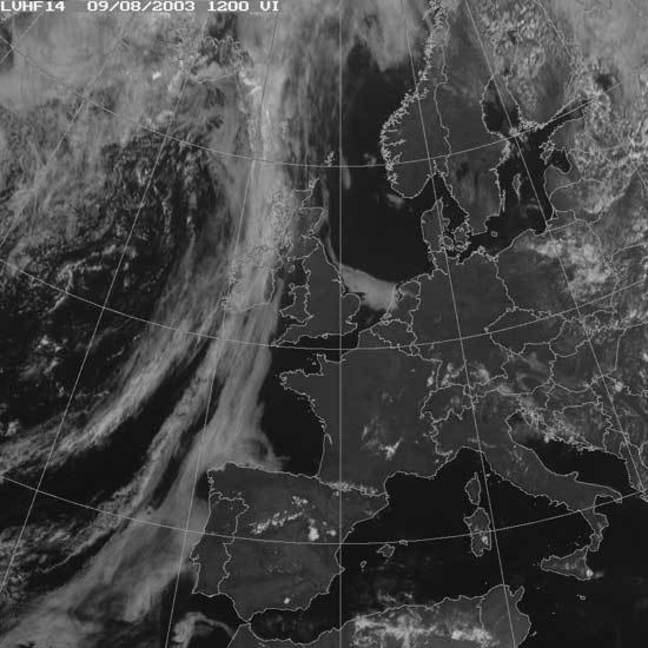 However, it’s worth noting those small, puffy blobs of cloud over the centre of Spain and France. In small areas, the sun has warmed the ground enough to make the air there rise and form localised summer thunderstorms. In Figure 2 you can see a typical satellite image showing Polar Continental air. Air blowing off Scandinavia is initially very cold and dry, giving a clear band of sky in the east North Sea and Baltic. 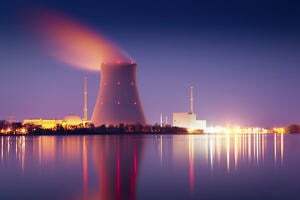 However, as it travels over the water it picks up moisture and eventually cloud forms – over the western North Sea and the first bit of the UK it reaches – the east coast. 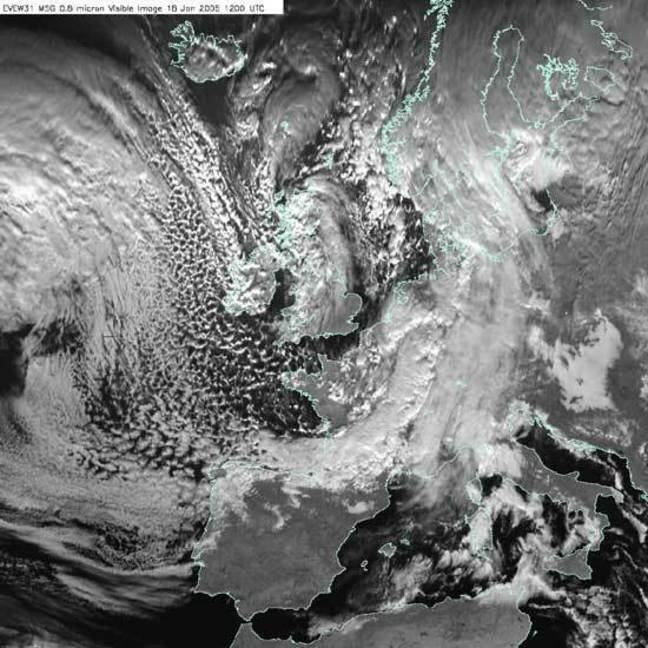 Figure 3, shows a very characteristic winter satellite image, as Polar Maritime air dominates UK weather. In the winter, the ocean is warmer than the land as well as being the moisture source – most of the convection (warm air rising) and rainfall occurs there. You can see the small blobs of convective cloud – puffy, cumulus clouds. The first bit of land the air reaches will be the west coast of Ireland, Wales, Scotland and England. As the air rises over the land, it cools further and more cloud, and rain, form. In Tropical Maritime air (Figure 4), the air is cooling as it travels North, so the cumulus clouds associated with convection don’t form. However, the air is cooling without rising, so cloud can still form – this time in large horizontal sheets of stratus cloud. Again, the water source is the ocean, so the cloud mainly forms there. This cloud won’t produce rainfall as heavy as that associated with polar air, but might give a steady drizzle. For a useful guide to identifying clouds, you can refer to page 5 of our course supplement. The characteristics of the air mass may change between summer and winter. For example, in the summer, even easterly winds from central Europe or the Ukraine could be counted as tropical continental, as the continent becomes so hot at this time of year. 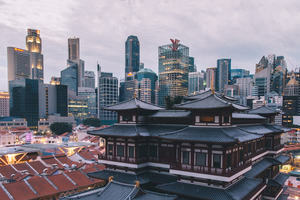 Also in the summer, the low cloud formed by Tropical Maritime air can be evaporated by the Sun during the day, clearing the sky but leaving the air warm and humid. With a polar maritime air mass, in summer, the difference between west and east is not as important – as the ground warms, local convection can trigger showers anywhere. We rarely experience Arctic air in the summer. Take a look at the beautiful image of current surface air flow on earth.nullschool.net. Using this image for guidance, can you see where you are based on the map? What direction is the air currently coming from in your area? What might that mean for the weather? Share your thoughts in the discussion below. Remember you can ‘Like’ and respond to comments made by other learners, and don’t forget you to include #FLRainorshine in any discussions you may have about the course on Twitter, Facebook or Instagram.